One of my favorite things to do with a free evening or Saturday afternoon is to catch up on my weekly DVR'd shows while messing around in my craft room. Cooking Channel's Kitchen Essentials hosted by Kelsey Nixon is always on my list of TV to watch. Her approachable style & unique flavor combinations keep me coming back episode after episode. 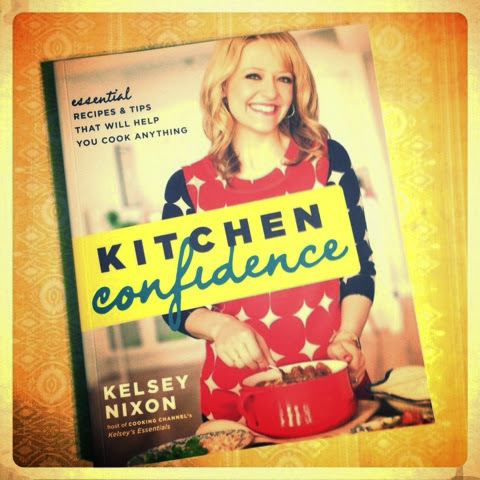 So, when I saw that she was coming out with a cookbook, Kitchen Confidence, I was really excited. 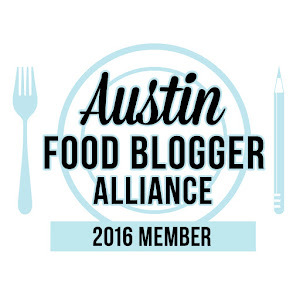 For the entire month of May, I'm diving in & devouring Kitchen Confidence. For 31 days, I'll be making dishes from Kelsey Nixon's book & writing about them here. 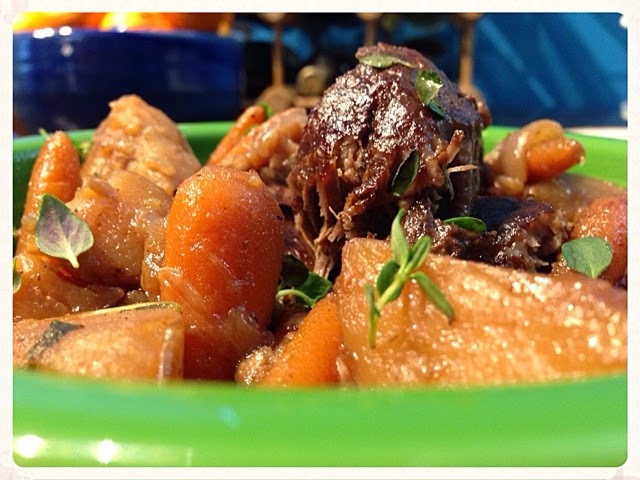 Today, I'm talking about the Pot Roast recipe from Kitchen Confidence. It was so good. And comforting. And flavorful. And simple. Growing up, pot roast was often a Sunday staple of my Mom's, as I imagine is true for most of us. 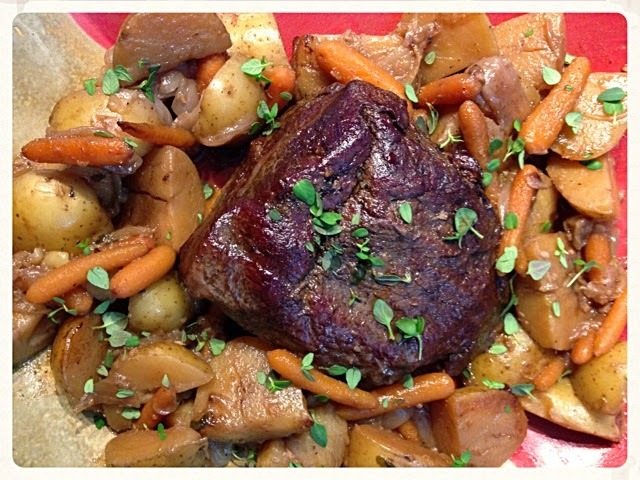 I know my husband Andrew grew up eating pot roast & in fact, I think even requested a version of it for his birthday! Now that I have my own kitchen, I don't usually make the same kinds of meals my Mom did. I enjoy pot roast & it always reminds me of home, but I have only attempted the surprisingly easy meal once or twice. Which is really too bad for Andrew, who still devours roast & beef stew any time he can get his hands on it. When thumbing through the pages of Kitchen Confidence, deciding which dishes I wanted to try, this pot roast was one of the first ones to get a little neon green stickie. With this recipe combining the comfortable flavors of slow roasted beef, carrots & potatoes freshened up with fresh thyme & red wine, I knew I couldn't go wrong. And I am so glad I went for it. The beef came out perfectly tender & the wine added a great depth of flavor. The vegetables melted in my mouth, but were far from mushy. And the thyme really gave a pop of freshness & color. 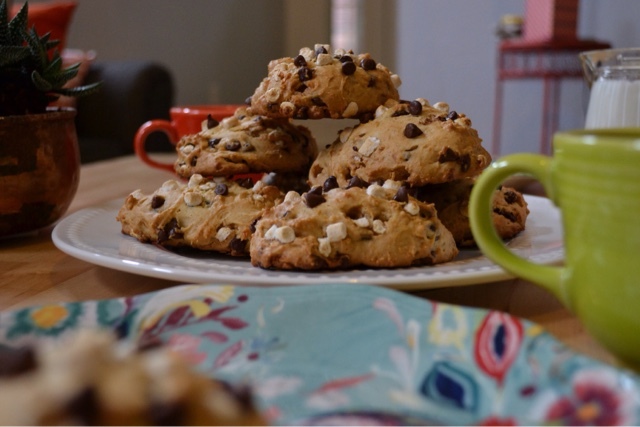 All in all, I loved the ease & flavor of this recipe. It even got Andrew's stamp of approval. After a quick prep & browning of the meat & veggies, all I had to do was kick back & wait. I was even able to finish up a springtime wreath while a delicious, Sunday-worthy dinner roasted away.